Dr. Muhamet Mustafa is the former President and founder of Riinevst Institute in Kosovo (Kosova). He was minister coordinator for the development policy and planning in the Government of former Yugoslavia (1986-1989), Minister for Development of Kosova’s government (1984-1986), Director of the Found for Road Construction in Kosova (1981-1984). He has also served as a Deputy in the Assembly of the Republic of Kosovo. 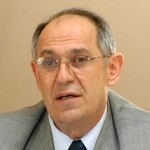 Dr. Mustafa is the author of numerous papers published in various professional and scientific magazines and presented in symposiums and conferences, as well as several books:Income Policy and Productivity (1981),Organization of the Investment System and the Economic Development of Kosova(1985), Cybernetics in Economy (1989, 1990), Cybernetics and Introduction to Informatics (1995), Management of Investment Projects (1997), Investment Management (2004), and Small and Medium Business Development (2006). Dr. Mustafa is also a cofounder of the Riinvest University and a professor at Faculty of Economics in University of Prishtina.